I came across this beautiful picture a few weeks ago in a magazine I picked up at the library. 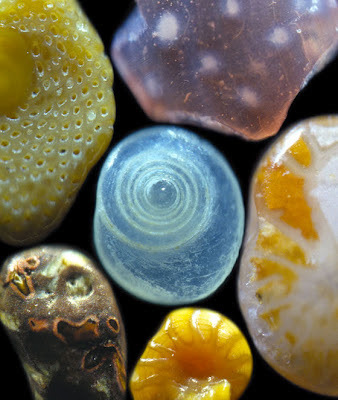 It turns out sand isn't brown or "sand" colored at all - holding a handful is like holding a rainbow as each piece is composed of tiny pieces of coral, lava and shells, among other things. Isn't it crazy, so much beauty right in front of us, beneath us, clinging to our clothes and sticky kids, pouring out of our shoes and socks every time we stand at the ocean's shore - all of these tiny, broken bits of beauty right on the edge of all that chaos - who could imagine such a thing? I spoke at my church last Sunday on the Doctrine of Creation and the whole talk consisted of two simple points regarding what it means to say we believe in "God the Father, Almighty, creator of heaven and earth." First, God is CREATIVE and second, this gives us HOPE. The God we find in Genesis 1 is too creative to look out over the dark primordial chaos and say, "Yeah, I ain't got nothin' to work with here." Instead God looks and pauses as a smile starts to spread and the creative juices get flowing. All that nothing gets God thinking, imagining and soon all that's good is flowing out of his words, out of the same wide-smiling mouth of God. The fact that God is creative tells us that dust and darkness and death are never what we fear them to be. Some of the most beautiful people I know are the one's who've been most deeply broken by life, but who cling to and allow their belief in God's creative power to recreate them. They, like the trees and rivers and mountains, become living, breathing proclamations of God's creative power. Gungor's song, "Beautiful Things" says, "You make beautiful things out of the dust, you make beautiful things out of us." What if we really believed this? What if we believed God sees more than dust and darkness and death when he looks at us, when he looks at our world? What if we started seeing this way too? This past Sunday we practiced our hope by writing the areas of our lives that need to be recreated on slips of paper and burying them in a sandbox as we came forward for communion. Silly, right? We all know nothing much grows in sand and that a little bread dipped in wine is just that. But the invitation remains to see beyond the chaos, the darkness, to trust in the One who causes streams to flow in the desert and transforms bits of wine and bread into that which promises to transform us all. We swallow the bread, we sip the wine and something new begins to spring up through the dry, dusty cracks of our lives - we are being re-created. Hope begins its work in us - the hope that things are more than what they seem, that even here, even now, the creator God is speaking goodness into being. I know it's hard. Some days I could swear that everything I see is covered with dust, layers of brokenness, layers of not-good-enough and never-amount-to-nothing-ness. The world seems so entrenched in its deadly ways and I choose too often to linger in the valley of the shadow of all this death; choosing life comes hard and often flies in the face of rationality. Sand is just sand after all and we do our best to shake it off and move on. Maybe the world isn't a battlefield of data and sound bites, an endless round in the race to control and interpret information. Maybe it's a field full of wild flowers sprouting up defiantly, daringly in the midst of all this chaos and darkness - can you make the time to see them? There's one at your feet just now, waving and swaying in the sunlight, exuding the scent of life and hope and love that overcomes fear. Or maybe the world is a sandy shore, a million pieces of beauty and light laying there beneath our feet. Can you see it? "Lay down here on the shore," God says, "Let your body rest, here, in the sand. Let these millions of pieces of broken beauty hold you until you can see them, feel them for the truth they are; until you can see yourself for the broken bit of beauty you are. Let the water wash over you, don't be afraid of the chaos. I'm creating you anew, even here, even now." If we could only see the beauty / intricate mechanisms found in a leaf or even in that chunk of wood we just threw in the fire. I don’t think our minds are capable of comprehending the creative genius of God in the physical world let alone in the spiritual realm. Thanks for the reminder! I always think of a devotion John did at paxton Ministries based on the chemistry of photosynthesis. My mind shuts down with those kind of things, but there so much of how our world operates is pure miracle. I love those glimpses we get...when we see, as you put it, through the lens of Christ. Hoping to improve my sight over time. Brandee, My children help improve my sight every day - they're such great teachers! Thanks for stopping by and commenting! "The world we live in is starving for hope, for something to believe in, that's why we fight so hard for our little brands of right and wrong, for anything that promises power and control." and yes, our only hope is to see through the lens of Christ. thanks so much for this. Letting go, letting go, letting go - the only cure I know for us control freaks! Thanks for stopping by. I also saw the most beautiful picture of sand the other day and was also so humbled by our Pappa's concern for even the smallest details. It amazes me how He never overlooks even the individuality of a grain of sand. I a, glad I visited your post from Emily's. Yes - everything has individuality, and yet we strive so to "blend in" and be the same. Tanks for stopping by, I'm enjoying the community created by a common thread. Some of the most beautiful people I know are the one's who've been most deeply broken by life, but who cling to and allow their belief in God's creative power to recreate them. wow. this is so true. allowing God to create hope out of our lives... the purest kind of art.